Does your school need a laminator? 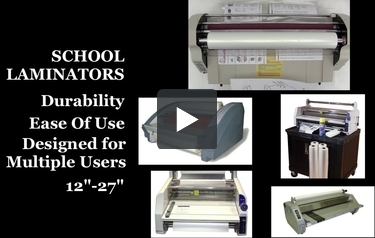 MyBinding carries a great selection of roll laminators that will make an excellent choice for your school. These units are designed to meet the specialized needs of elementary, middle, high schools, and other educational institutions. Designed for durability and ease of use they are ideal for use in schools where multiple users are simply a reality. Choose a small inexpensive model such as the GBC Ultima 35, the GBC Ultima 65 which is the most popular school laminator in the country, or a more versatile model such as the Tamerica TCC2700. Check them out for yourself today. Welcome to MyBinding video. If you’re looking for a school laminator, you’ve come to the right spot. MyBinding has so many choices. A simple scroll down this page will reveal that we have all that you might need. Up to 27 inches, these roll laminators really put out a lot of work. Our knowledgeable staff is ready to assist you in picking the right machine for your purpose, whether it’s large or small, hot or cold, comes with a stand or is table top, we can help you find the right selection. We strive to have demonstration and how-to videos for every product that we sell so you can see the product in action before you buy it. So give us a call, click or chat. We’re here for you and your school. When image matters, MyBinding.